Well, we hope you guys (and gals?) have enjoyed our drag racing theme this month. In all actuality we've only just scratched the surface of this rather old and vibrant scene, but hopefully we've given you a feel for many facets of this motorsport. 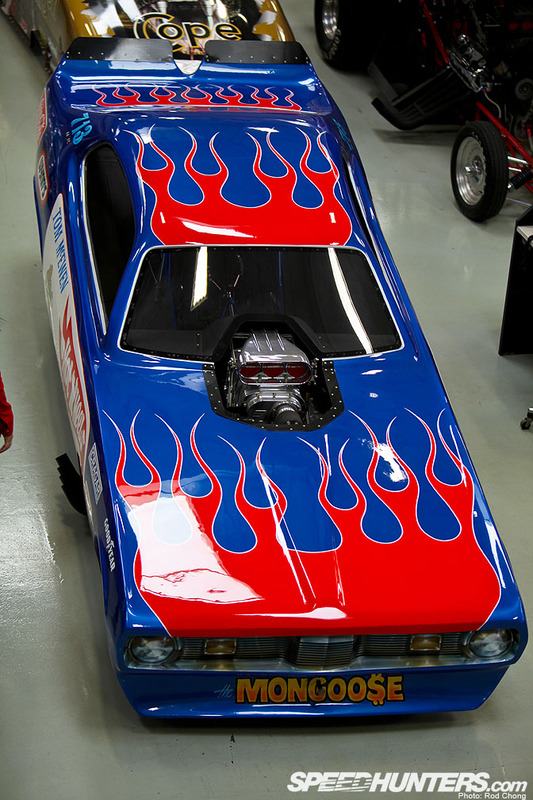 Before we move on to November, I wanted to showcase my own little contribution to Drag Month: a tour of Don Prudhomme's personal collection of funny cars. 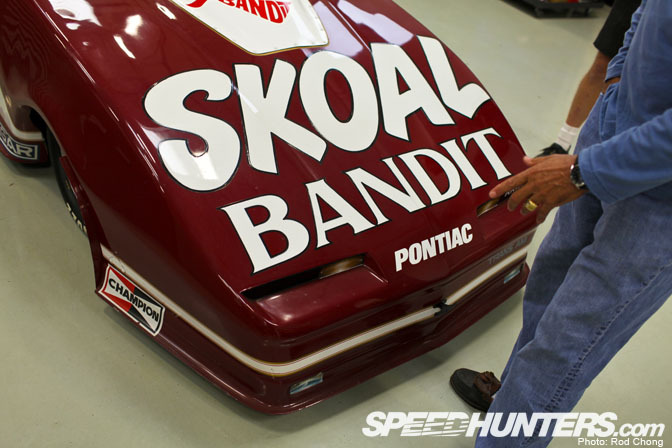 This collection spans just about every era of funny car racing, right from the pioneer days of the class up to the present. So I thought this would be a great way to see how the technology of these machines has evolved over four decades of racing. 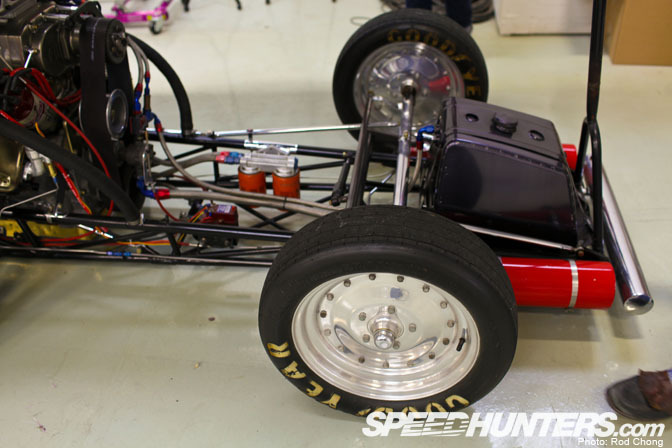 These dragsters have gone from 8 second machines just breaking the 200 mph barrier, to 4 second machines topping out well over 300 mph in the quarter mile. So I asked Don to show us each car in sequential order so we could understand the evolution of the Funny Car. And now they are exercises of pure streamlining…. but let's start back at the beginning. 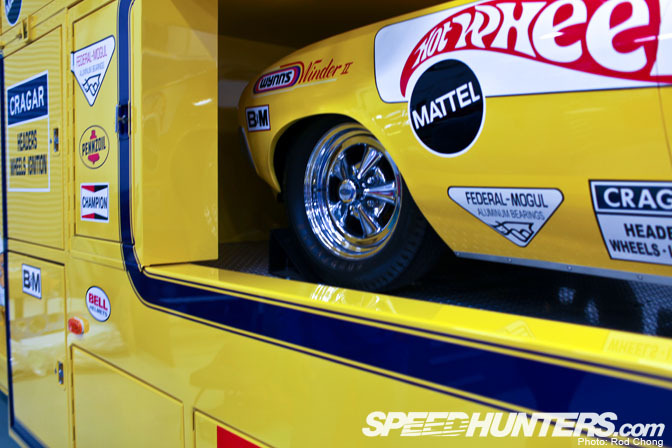 The collection goes back right to the start of Don Prudhomme's funny car career with this 1970 Plymouth Barracuda. 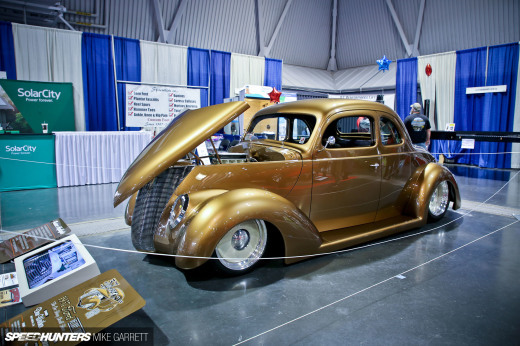 This is a period perfect restoration of the original car, right down to it's 466 cubic inch Chrysler Hemi, Ronnie Scrima chassis and Cragar/Halibrand wheels. Back in the day, this was as state of art as it got with Don's best time in the car being in the 7.10 range at 210 mph. For the 1972 season it was replaced by an updated spec Barracuda. 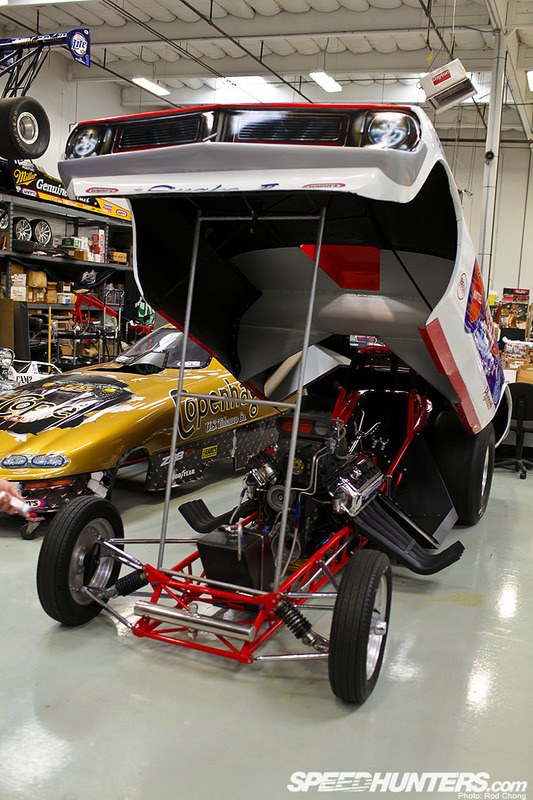 Open this car up and you see the foundations for the modern funny car chassis are already in place, care of constructor John Buttera. 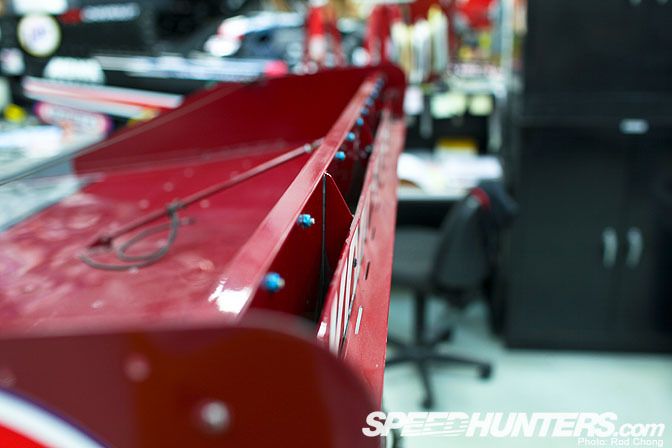 He's known for writing the book on Funny Car chassis fabrication. 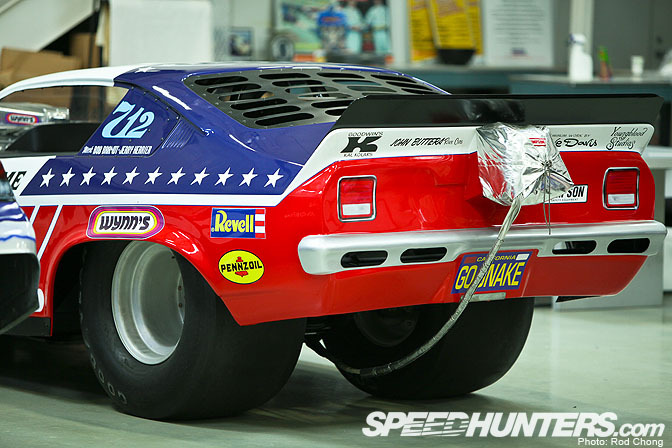 The car itself is a few hundred pounds lighter than the 1970 machine, with the Hemi engine capable of 1600 horses. The independent front suspension is a curious choice though! Don is also in possession of his team mate's car from 1972. Can you imagine piloting this into the 6s at 220 mph?… I should mention this is reproduction machine, the only one in the collection which is a brand new creation. Now things start getting crazy iconic. 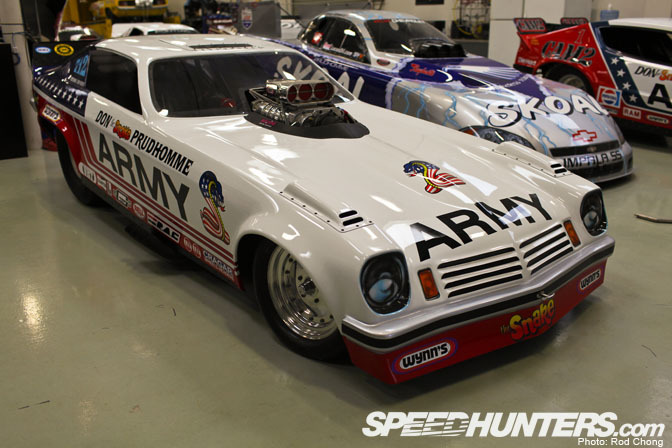 This is Don's 1974 season machine: it's a Chevy Vega shell complete with the first iteration of the famous Army livery. You may also notice the sponsorship had shifted over to Revell at this stage. … with attention being spent on allowing air to exit the shell. 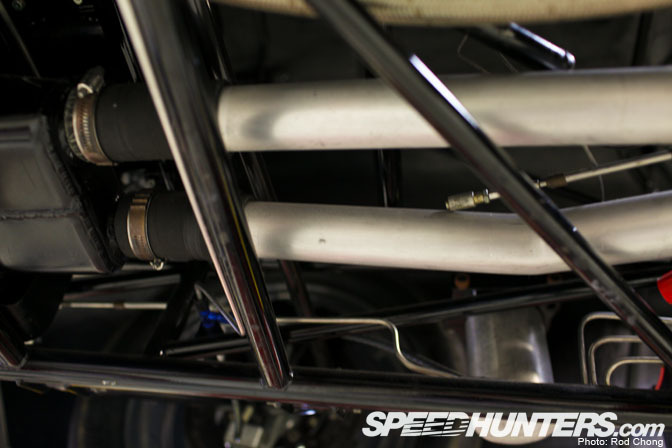 Although the chassis is very similar to that of the 1972 car, a simpler front torsion bar setup had replaced the independent front suspension. 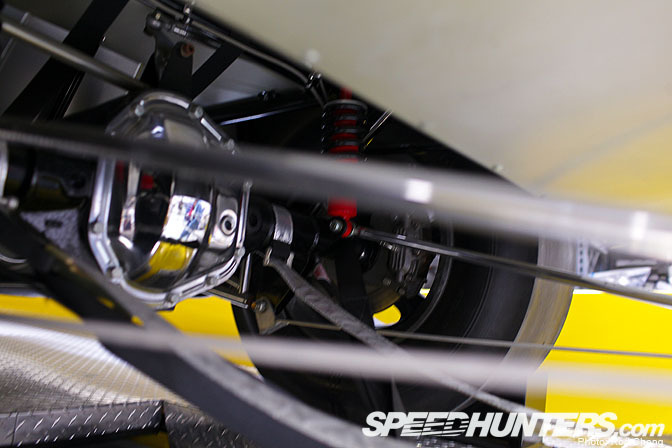 The reason for this, was that emerging slipper clutch technology was allowing the cars to leave the line without wheel standing or bouncing… so suspension was no longer really a factor. 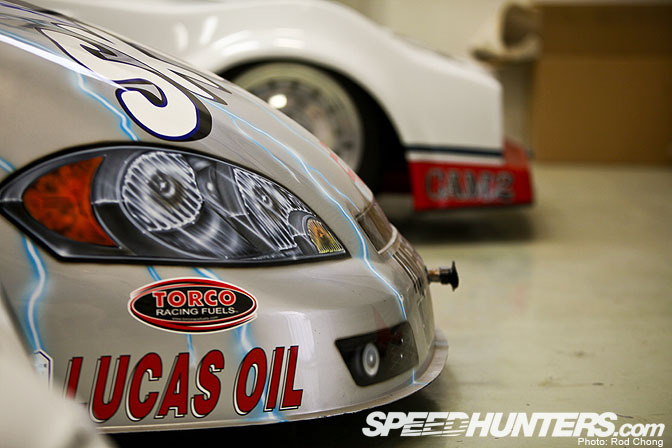 ETs with this car were now down to 6.43 at 230.76 mph. 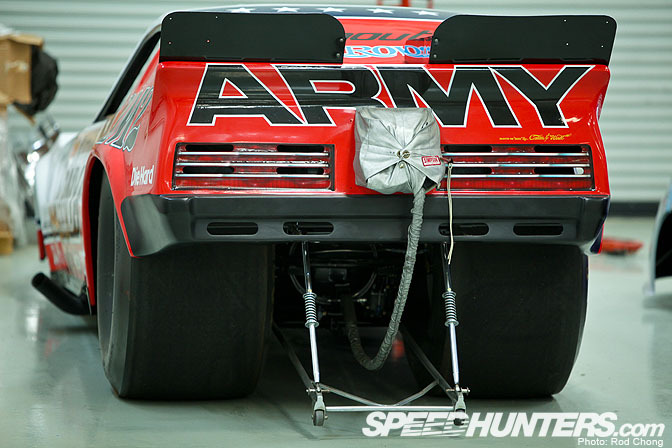 Unfortunately Don isn't in possession of the most famous Army funny car of all, his Chevy Monza, so we'll move on to look at this 1978 Plymouth Arrow. 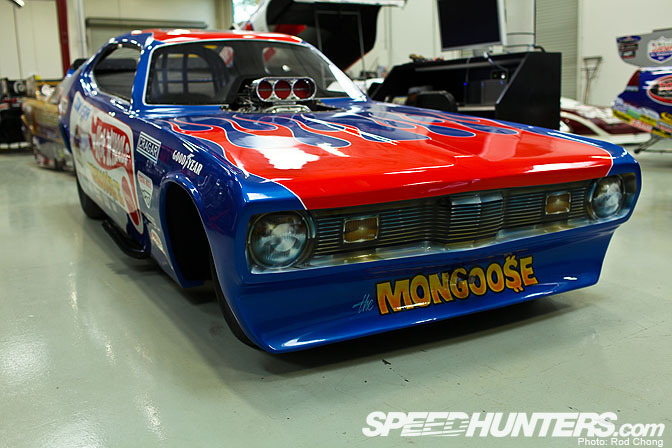 Yes this is basically a rebadged Mitsubishi Lancer funny car! That's an ironic thought. Note that big number one. At this stage in Prudhomme's career he was the man to beat having been Funny Car champion four times between 1975 and 1978. 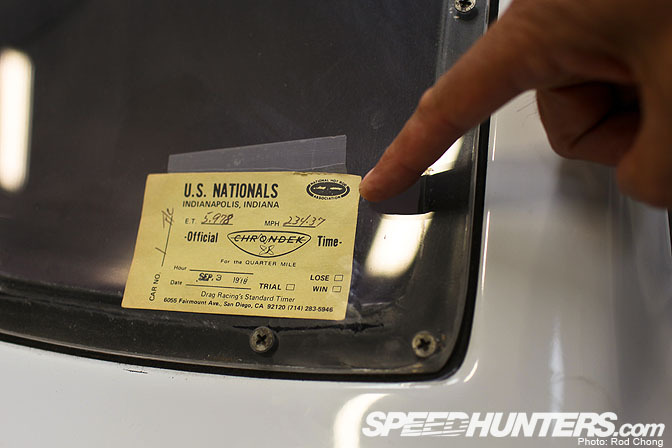 Looking at the timing slip on the car, from the 1978 US Nationals, you can see funny cars were now into the 5s. Wheel bases were up too. 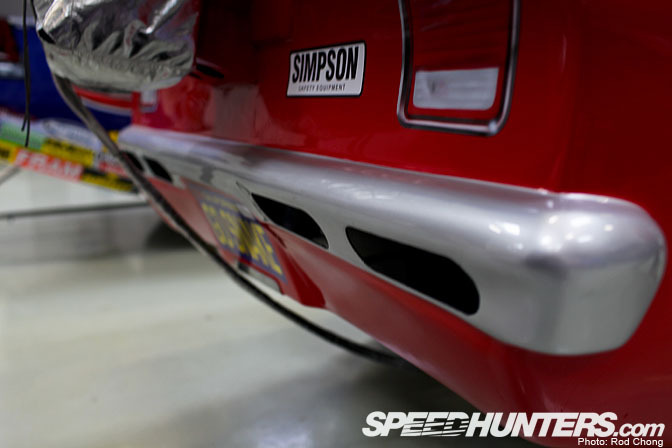 This car is 120 inches between the wheels, compared to the 118 inch measurement of the Vega.The constant lengthening of the cars finally caused the NHRA to enact the 125 inch rule for the wheelbase, which still exists today. Also notice how the fuel tank has been moved in front of the axle line. Look again at the Vega and you can see the progression in setup. BTW if we quickly jump back to the 1970 Barracuda you'll see this car has more in common with earlier 1960s build paradigms. Same in the front too… this car was the last vestige of a chassis design which vaguely resembled a production ladder chassis. 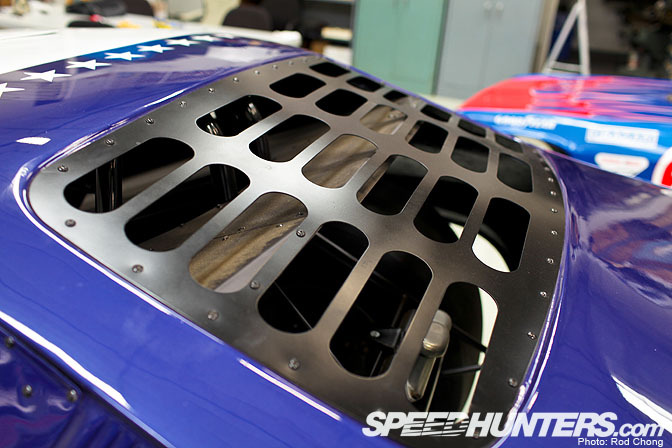 Two years later and the template for the modern funny car chassis was already coming into effect. Let's now jump forward to the 1980s and look at this 1982 F body marvel. 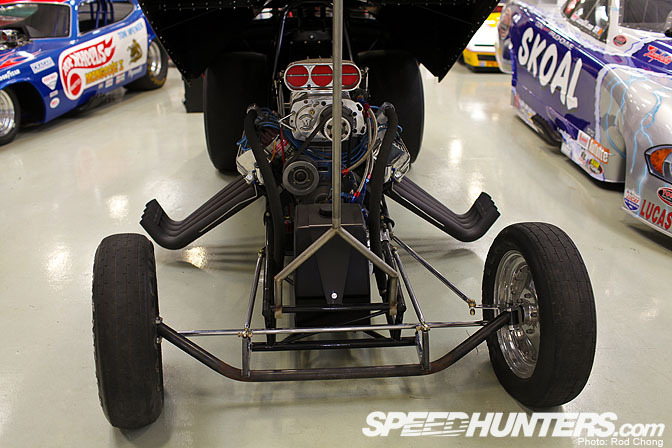 This dragster will forever been known as the first flopper to break the 250 mile per hour barrier. 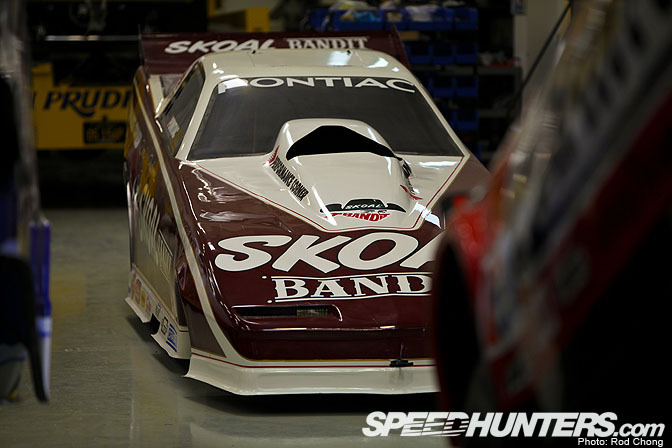 It's also the first Funny Car that was designed with the aid of a wind tunnel. 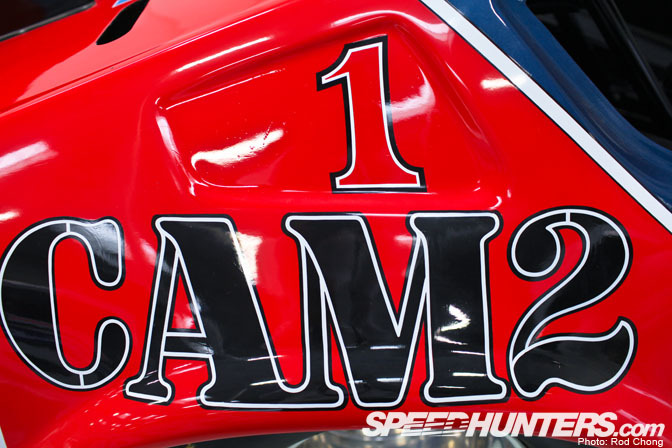 Note hand painted graphics here! 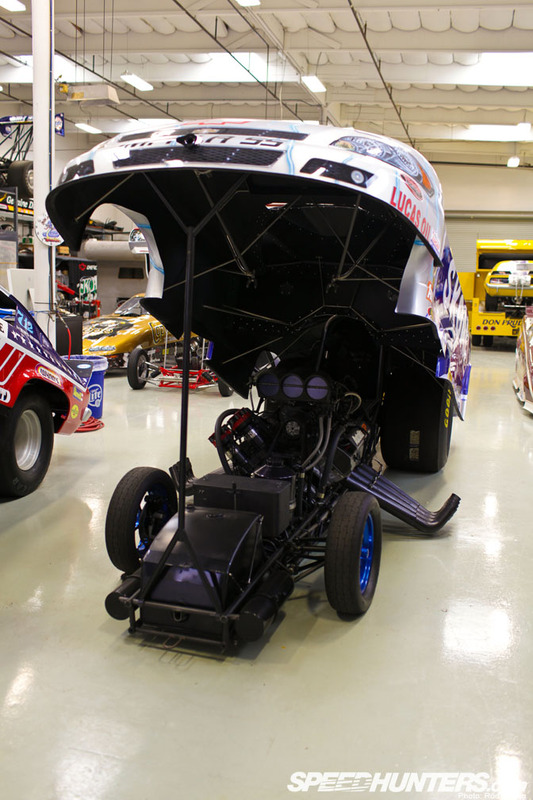 Jump forward to the late 80s and you can see the increasing effect of the wind tunnel taking form in funny cars. This is his Firebird drag car from 1987. Looking at the 1989 spec car we can see aero detailing around the front wheel arches. That's a vortex generator on the leading edge. The engine is now hidden under a smooth cowling. And out back there are some interesting aero designs going on. See those flip-ups on the rear bottom edges of the fenders? You can also see the rear window has been narrowed into a teardrop shape to direct more air to the rear spoiler. 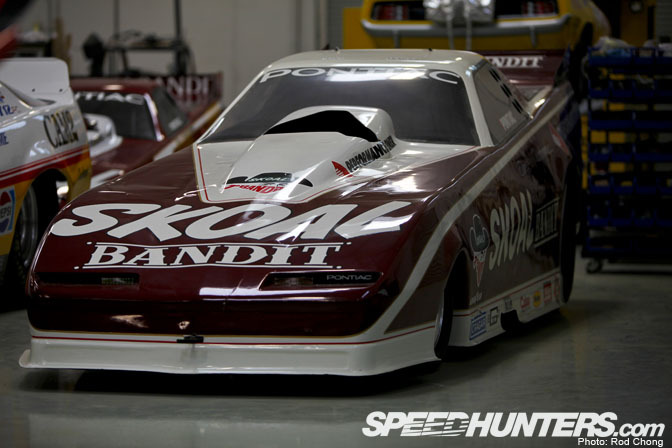 This is the beginning stage where Funny Cars were starting to morph away from resembling their production car equivalents. Now here is a bit of trickery… this opening behind the gurney flap is pulling up air from inside the car… it's a bit of a ground effect system which was quickly banned. Let's jump forward to 1997. Don retired from driving in 1994 so this would be the first of his owner cars in the collection. This is a full composite bodied car too BTW. 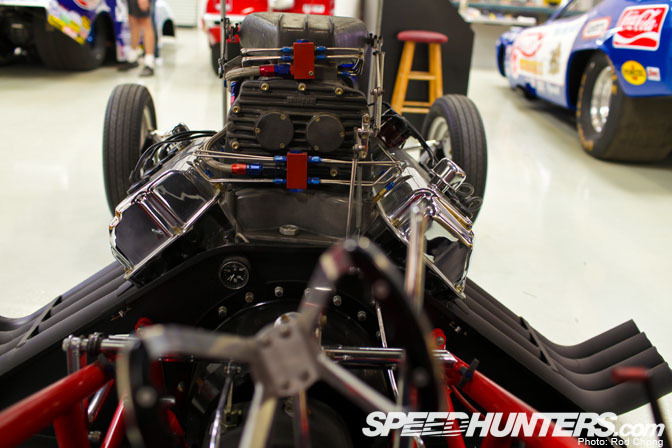 This car is undergoing a full restoration and would normally be sporting a full bellypan. Let's look under the car. 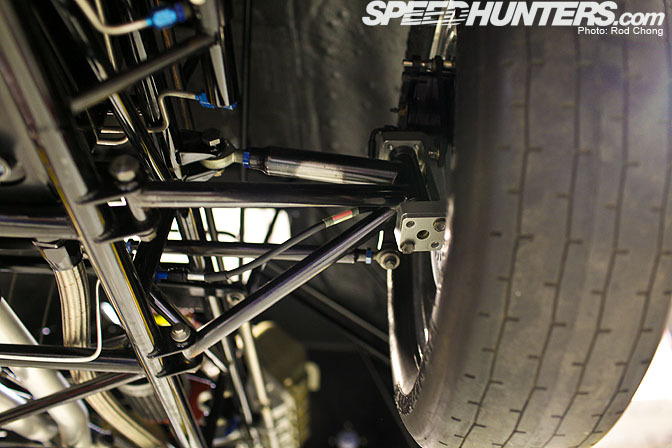 You'll notice that although the car has no suspension movement, it still has adjustable arms. 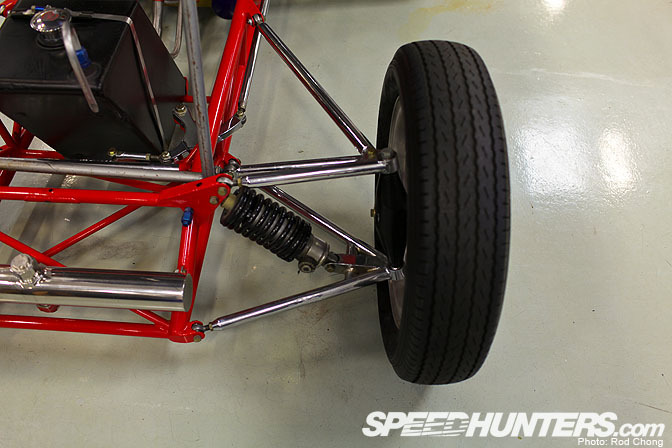 This is to allow the chassis to be "pre-torqued" to counteract the force of the engine's rotation… meaning that one front wheel will be pressing into the ground more than another… does that make sense? Yes those are the fuel lines! 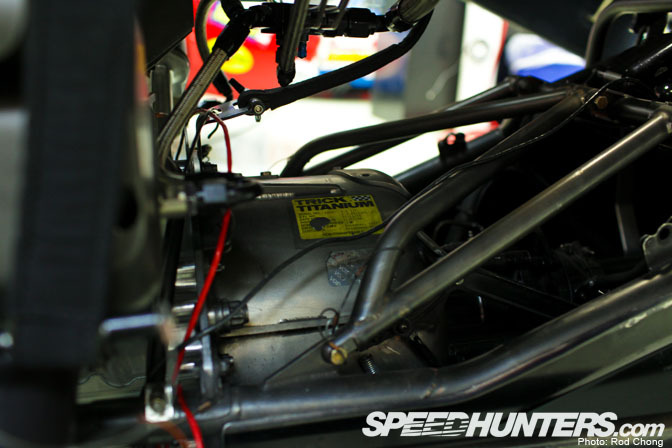 The car is running a 70 gallon per minute fuel pump! This Camaro (and I use that term loosely) was the first ever FC to hit 315 mph on the quarter mile… try and wrap your mind around that! 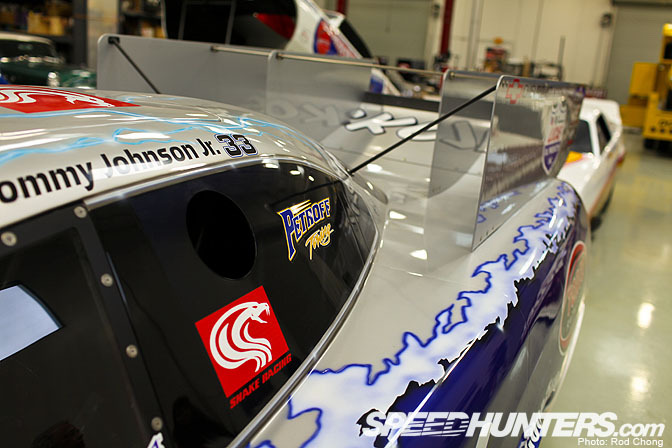 And this brings us to a 2007 spec funny car. Yes the chassis set up looks somewhat similar but the game has really moved on by this point in our story of the flopper. Such is the complexity of these machines that literally takes a crew of 9 or 10 people to run it. 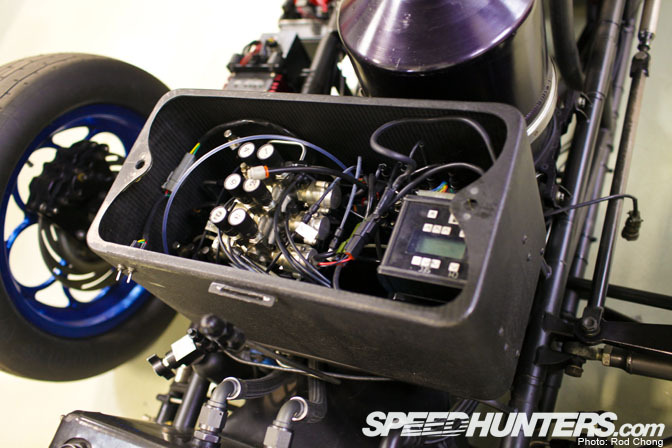 This black box contains the clutch, fuel and timing management systems. The stats of this car are truly astounding. Can you say 7000 horse power? 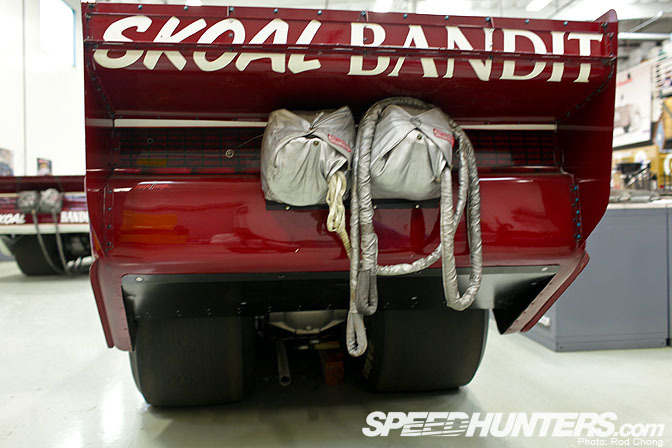 The blower itself takes one cylinder to run: that's the equivalent of one NASCAR engine! 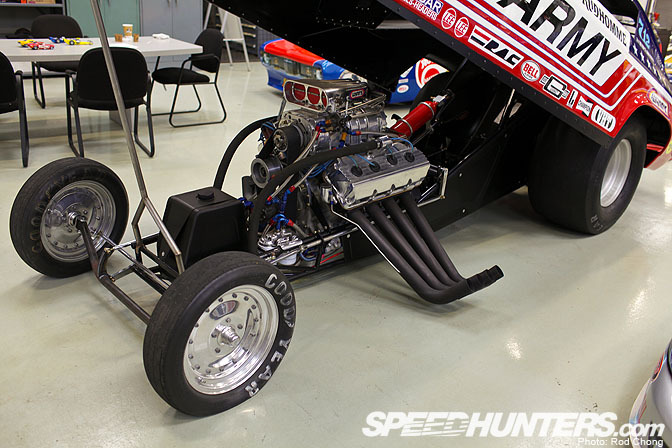 Check out the unusual set-back blower. The Snake explained to me that 80% of the air being pushed though a blower comes from the front section. 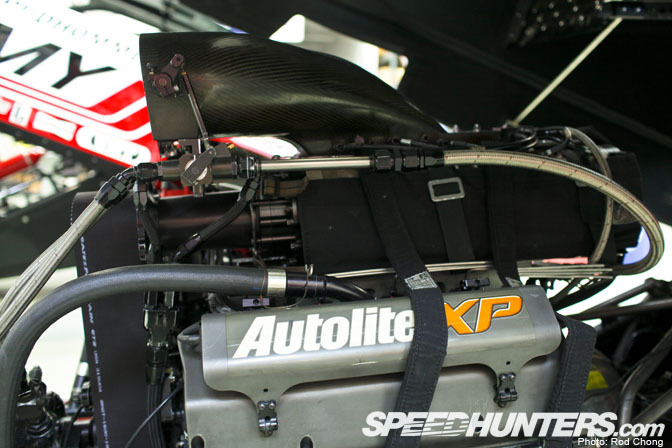 So higher performance was possible if it was mounted further back on the engine. It's literally within arm's reach of the driver… a scary thought! 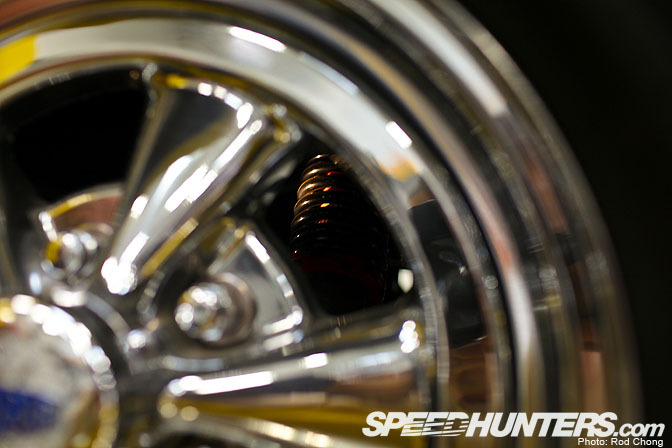 This housing contains a five disc clutch which is operated by a computer controlled piston or "canon" as Don refers to it. It's basically a hydraulic jack that controls the car's launch. The program that controls the movement of the jack, will ofter be the subject of much set up work over the course of a drag weekend. Outside we can see that no compromises have been missed with the shape of the car. It bears next to no resemblance to a standard Impala and thus in my mind is a bit of the end of the line. It's this type of machine that perhaps the new Nostalgia drag movement is a bit of a counter reaction against. Call me old fashioned but I prefer my race cars to look like real cars… Is that an unreasonable ask? 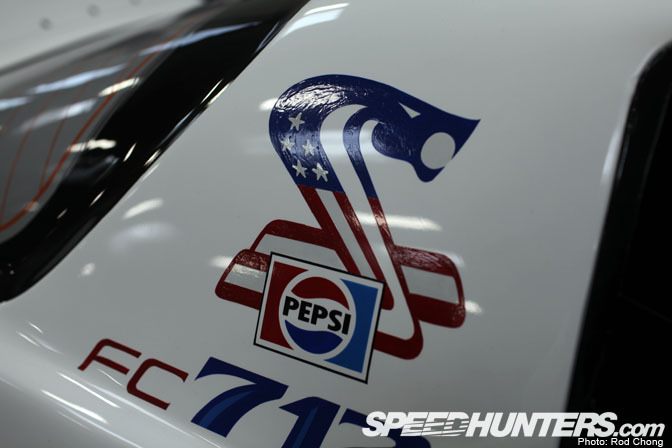 I've sat in a lot of race cars in my time as a Speedhunter, but nothing felt as extreme as this. You literally are in the center of hell here… a purely inhospitable place for any human being! 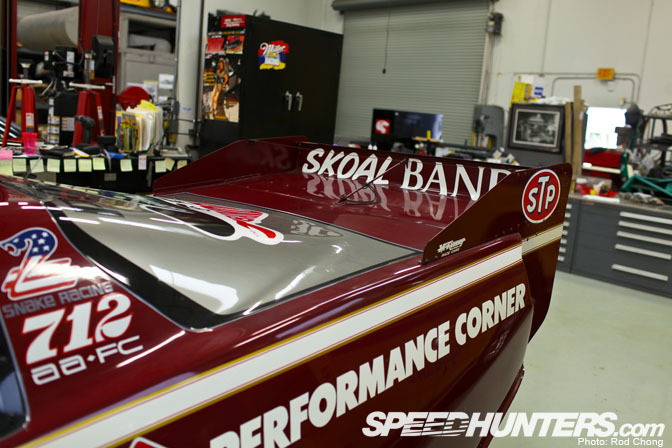 Ok I'll be back soon with part2 of our look at Don Prudhomme's home base. Massive props to those who spend the time and money to keep these machines around and operational. LOVE this feature! Thanks for the pics. This will be a great reference for building scale models of ,Snakes cars. Thankyou thank you so much, what an article. Please could you do more articles on behind the sceens of workshops. I can't wait for this month to be over... The only thing worse than drag month would be NASCAR month! One of your better articles imo, great work. Smiled ear-to-ear throughout. That is amazing! Great article and one hell of an opportunity to see Don's special collection. Im not too into drag month but this article and the lc torana article were great. WOW. 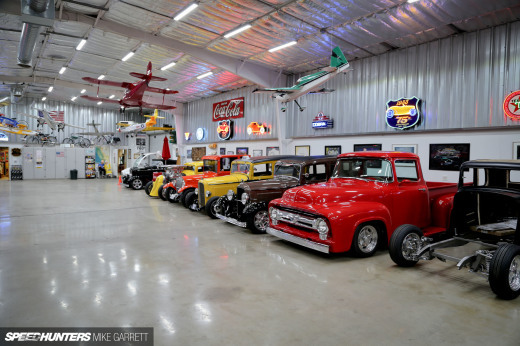 All those Hot Wheels and model cars I had as a kid are actually REAL and sitting in a garage here under one roof! Thank you SO much for taking us on a tour of these machines - Brings back so many memories of growing up seeing these machines, but it was never up close and in detail like this! Love the technical stuff (early aero trickery? awesome! ), please keep it coming!!! I'm wondering why they banned the rear spoiler ground effects. If everyones got it and it helps performance, I say go for it.